Platinus occidentalis.Arthur Haines.New England Wild Flower Society.gobotany.newenglandwild.org. (Accessed 8/2014). 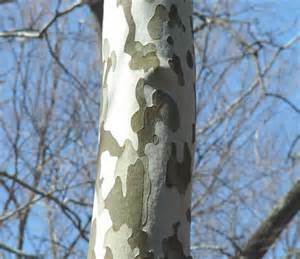 Platanus occidentalis is a tree to 50 m, attains diameters to 3 m; lives about 200 yrs; bark thin, smooth, gray-brown exterior bark peels leaving whitish patches; underbark usually chalky white to creamy, very distinctive in winter; winter buds to 0.9 cm long, conical, blunt-pointed, 1 outer scale, formed inside leaf stalk base; stipule base surrounds twig, leaving scar ring. Leaves broadly 3-5-lobed, lobes wider than long, 10-18 cm long (leaves of sapling or sprouts often nearly 30 cm wide), often wider than long, sharply toothed, base lobed, young leaves densely wooly-hairy, mature leaves tan-wooly-hairy on veins below, grayish-green; leaves expand early-mid May; winter plant leafless 180 days (Britton 1874). Flowers monoecious, tiny flowers in round, unisexual heads; blooms May. Wind pollinated. 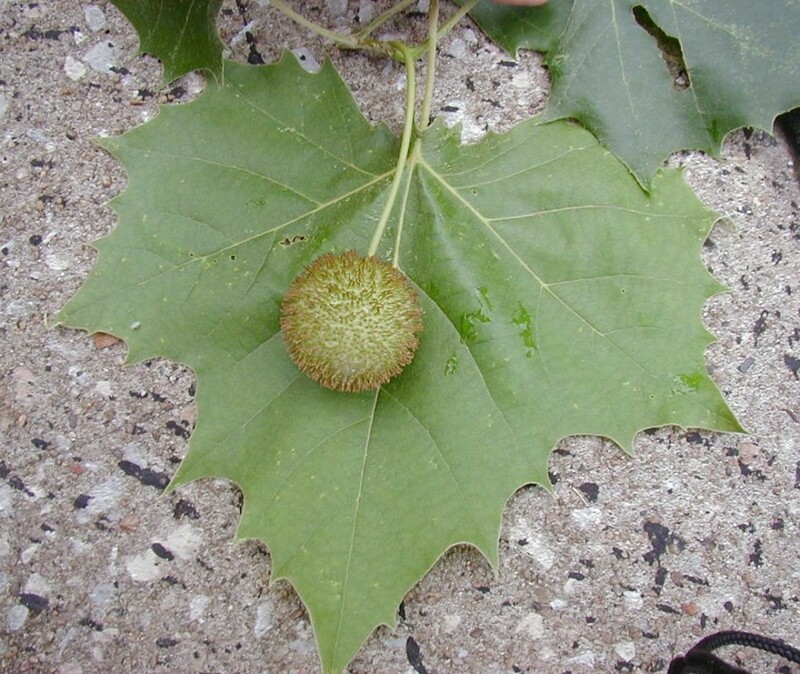 Platanus occidentalis.leaf and fruit.Copyright © 2016 – Division of Plant Sciences University of Missouri.plantsci.missouri.edu (Accessed 3/2016). Fruit round, about 3 cm diameter, solitary, appearing fuzzy, dangling on thin stalk (Dirr 1990; Rehder 1986); seeds linear with numerous long hairs, Nov.; wind dispersed through winter, also water dispersed in flood plains; seeds need light to germinate. Seeds eaten by finches and squirrels. Habitat: Pioneer on open, moist to wet soil, flood plains, soil pH 4.9-6.5 (USDA, NRCS 2010). Somewhat shade tolerant (Hightshoe 1988). Notes: Young trees stump sprout when cut. Defoliated by sycamore anthracnose caused by the fungus Apiognomonia veneta, causes loss of leaves in spring but regrowth usually occurs later in season. Also subject to canker-stain caused by the fungus Ceratocystis fimbriata, causes death of foliage, stems and sapwood. Spores probably transmitted by insects (Burns and Honkala 1990; Sinclair et al. 1987). A host tree of the Asian longhorn beetle, Anoplophora glabripennis (see Norway maple). Difficult to distinguish from escaped London plane-tree (P. x hybrida), which usually has darker under-bark, fruits in pairs and grows on upland sites.